While most of us were smoking ourselves stupid and making terrible dietary choices over the 420 holiday, Jerome Baker Designs (JBD,) Weekend Unlimited, and a team of skilled glassblowers were hard at work building Bongzilla, the worlds largest bong. Bongzilla was created in The Martin Blank Studio is in Seattle under the shadow of the Space Needle. 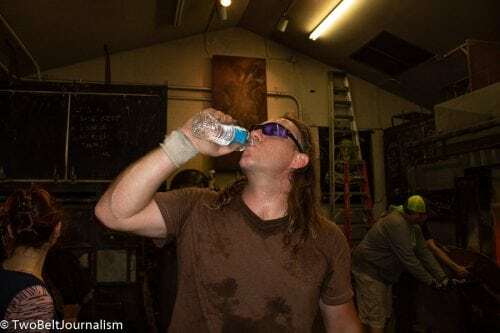 Jerome Baker Designs and a cavalcade of media outlets took over the studio for 4/20 weekend, the back of the studio was opened up and we took over the back alley for a 420 celebration full of hot metal, glass, artistic vision and fantastic cannabis flower and concentrates. Jerome Baker is one of the most famous names in glass culture. Jason Harris started blowing glass under the pseudonym Jerome Baker to pay homage to Jerry Garcia of the Grateful Dead, and to keep his glassblowing business out of the snoopy eyes of the law. Harris has been spearheading functional glass art and glass culture for 28 years, showing that the glass medium isn’t something that should be in the shadows, but in the museums with more traditional artistic mediums like canvas or pottery. The studio itself was controlled chaos, a scene of glowing furnaces, flaming torches and steaming buckets of hot instruments clashing with cool water. Glass blowers holding steel rods with molten glass beads on the end are running back and forth between hot wells of fire. The main piece was surrounded by several artists, being spun, molded, and shaped with tools that look like scorched paddles. The operation hums with precision, like the Patriots offense during a two-minute drill. Each person has one job, even if it’s as simple as opening and closing the furnace door. Limiting each person’s responsibility limits mistakes in a high-stress environment with no room for error. Bongzilla will be 24 feet tall. It has to be created one piece at a time. The pieces are stored and will be transported to Las Vegas, where it will be assembled under the guidance of an expert glass engineer. Harris acts as the Bill Belichick of the operation, standing on the sidelines and directing when he needs too, making sure everyone is in their place. He’s also a gracious host, answering questions from the numerous media organizations in attendance and describing to attendees what they were seeing in front of them. Charlie Lowrie is on the front lines, quarterbacking the artists and directing traffic. He also does a lot of the shaping and molding of the piece, much like Tom Brady shapes the Patriot’s offense while it moves down the field. “It’s all about the dance,” Harris says. Lowrie has been in the glass industry for over 20 years and works with JBD on special private commissions, like the 1998 Amsterdam Cannabis Cup. Lowrie loves projects that challenge his skills and force him to problem solve. He’ll take a project not even knowing if he can complete it. He relies on his experience and the ancestral knowledge of the glass-blowers that came before him. Lowrie has great reverence for the culture and practices of glass-blowing. Through studying its history and practicing the art himself, he believes that glass art provides windows into the soul. He uses that knowledge to problem solve on every project he attempts. Outside of the studio was more low-key. Josh from Earthgreen, a cannabis brand from Humboldt County and Chris Davison, the C.O.O. of JBD were serving up bong bowls, dabs, joints, and Earthgreen’s solventless rosin. The one and only, Jake The Professor, was playing host while helping guests network and connect with one another. There were only about five of us in the circle getting nice and medicated while everyone else was enamored by the screaming torches and molten glass inside the studio. Josh packed a bong bowl full of flower grown in the Humboldt County sun and Skittlez rosin and handed it to me. A fruity flavor and overwhelmed my mouth when I exhaled, followed by a strong body buzz. Shortly after that smoke circle dispersed, cannabis chef Jeremy Cooper showed up with his associate Anthony Nitowski, who calls himself “The Dab Doctor,” was carrying 0ld school doctor bags, filled with all the tools needed to serve dabs to everyone. 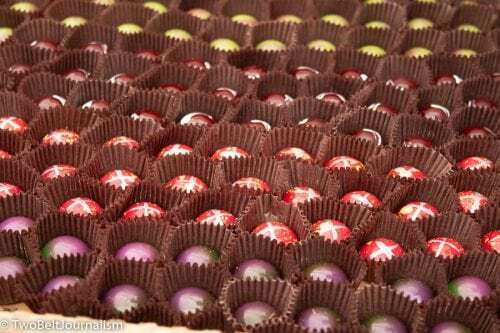 Cooper brought artisan CBD chocolates that were infused with strain-specific terpenes, like Grandaddy Purple. Each one had a flavor I’ve never tasted before, some were closer to flower than candy. Not something I would eat on a regular basis, but something I’m glad I experienced. When I was done trying the chocolates, there were two dab rigs attached to electric nails and slabs of shatter in pizza boxes. 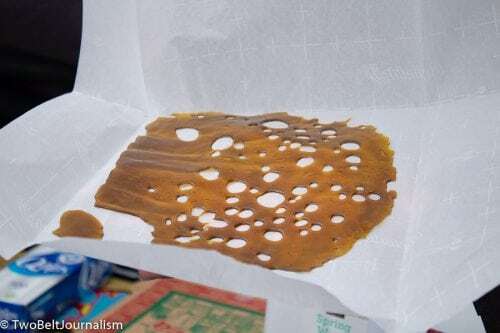 Once the nails heated to the correct temperature, around 650 degrees, we were allowed to help ourselves to slabs of dabs. The citrusy shatter and fancy chocolates were a fantastic end to a special event. Although there was only a modest turnout all weekend long, everyone there realized we were part of something that had never been attempted before. When all of the pieces are assembled in the Cannabition museum in Las Vegas, and Bongzilla takes its place amongst the other exhibits, we watched Bongzilla’s scaffolding be forged and pulled from the fire one piece at a time.